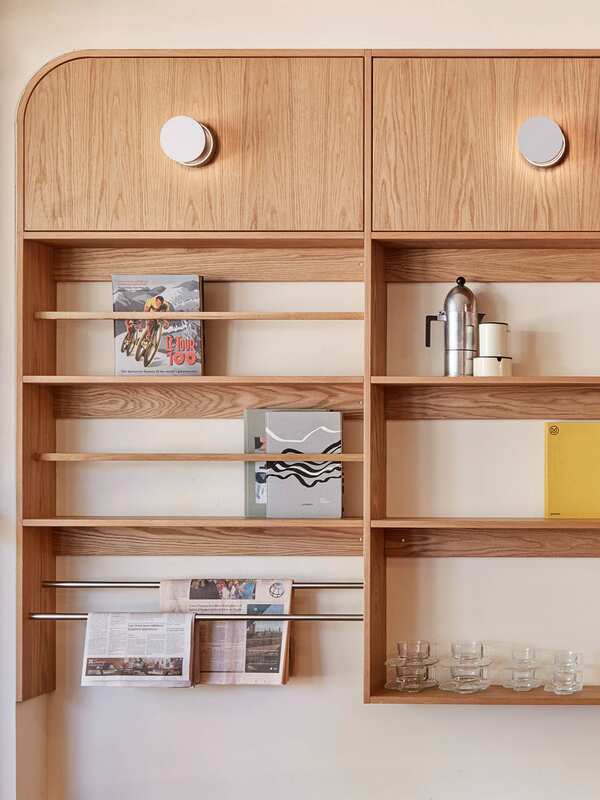 Former Australian track-cycling champion Tim Willing and wife Veronique gave Ohlo Studio an unconventional design brief. 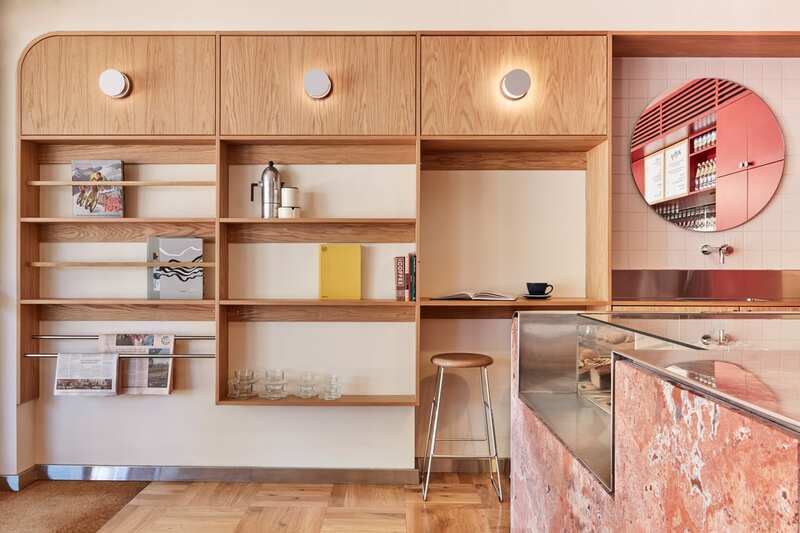 The pair stipulated a classic, Italian-inspired café designed like a jewellery box, which incorporated their loves for both competitive cycling and coffee harmoniously. 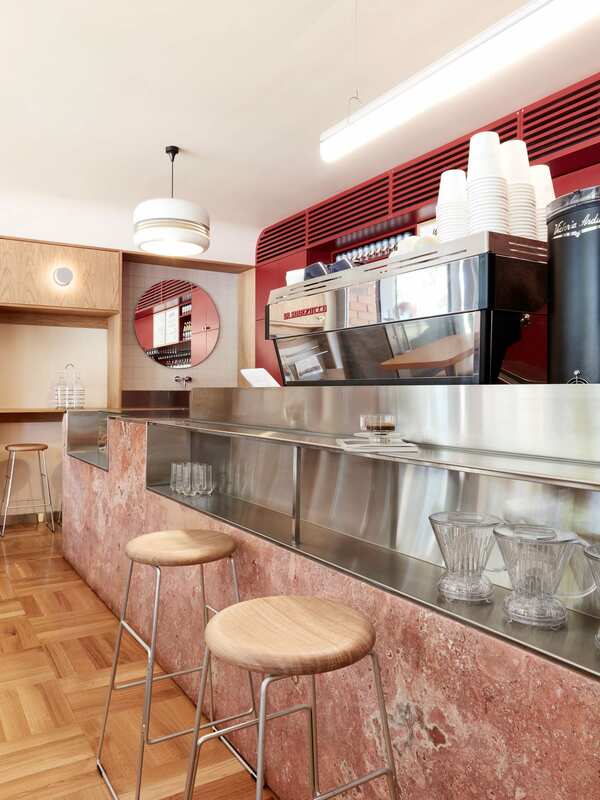 The result is Willing Coffee in Guildford, Perth, a suburb with thus far slim pickings when it comes to good quality caffeine. 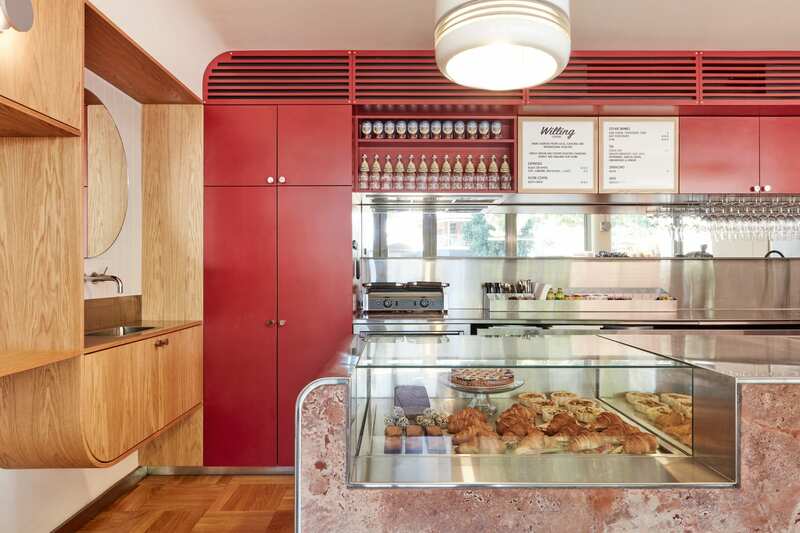 Willing’s top-notch barista keeps local regulars happy, but the flawless interior surely helps to draw a crowd. 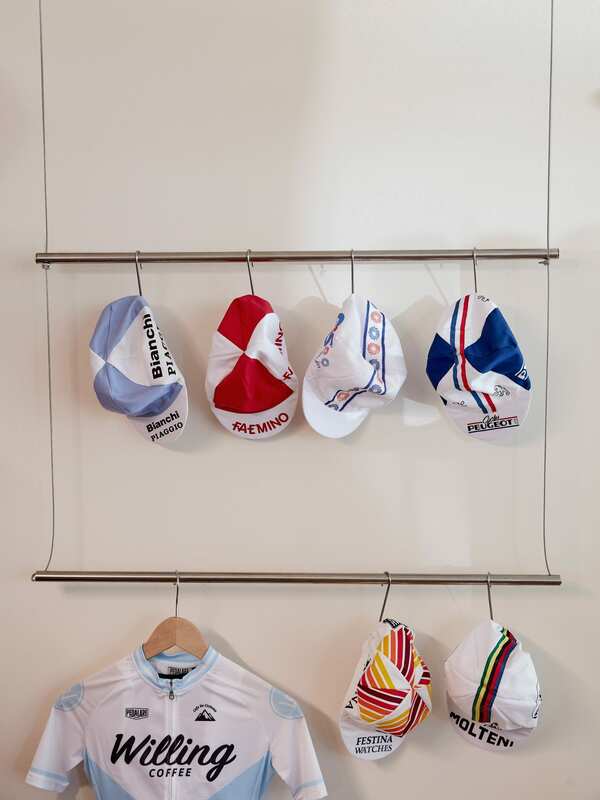 Ohlo’s design was largely informed by research into early industrial designs from the ’50s and ’60s, combined with vintage cycling styles. The era saw the genesis of industrial design as a profession, and mechanical equipment was designed with increasing consideration for the household environment. Manufacturers realised they had to appeal to women to get into homes, and incorporated fluidity and softness to their designs. 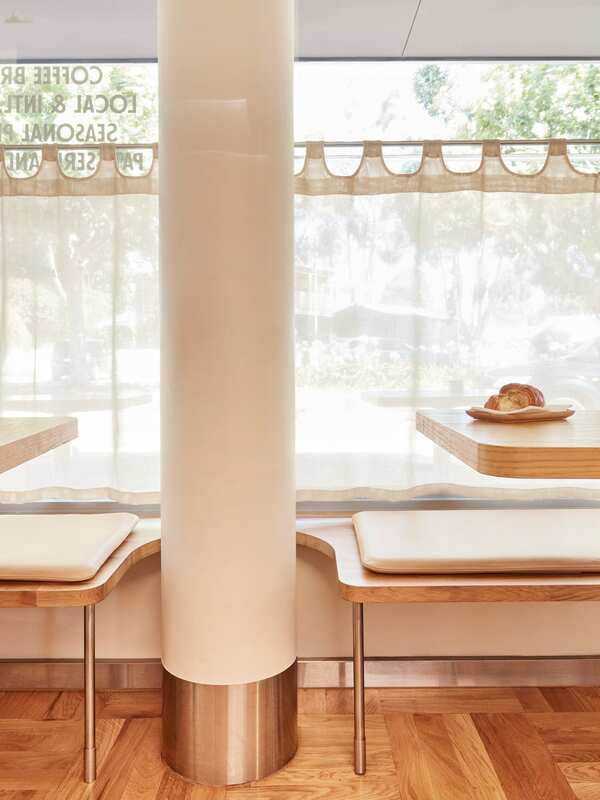 Italian mid-century diners were the main inspiration for Ohlo to combine femininity with technical, mechanical references. 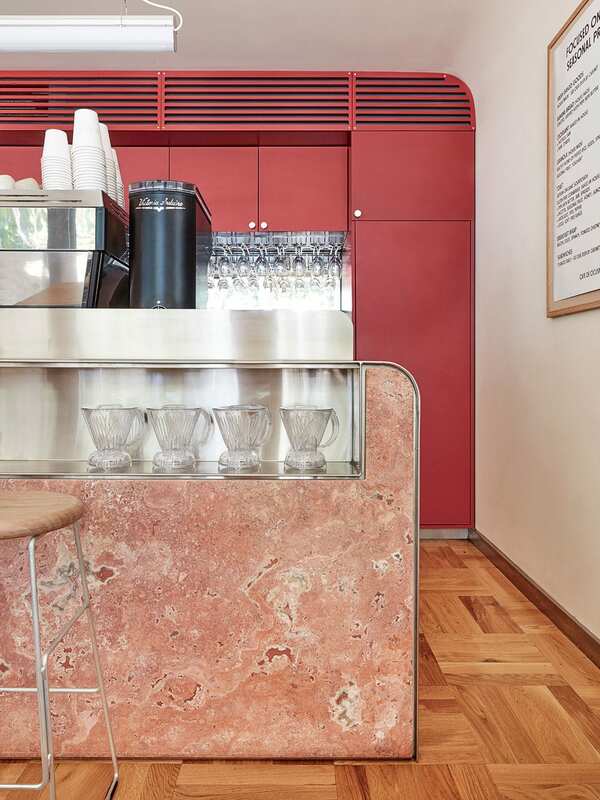 A simple folded stainless steel counter wraps a striking Persian Red Travertine front. The stone adds a natural dimension to the venue, looking at once warm and sharp. 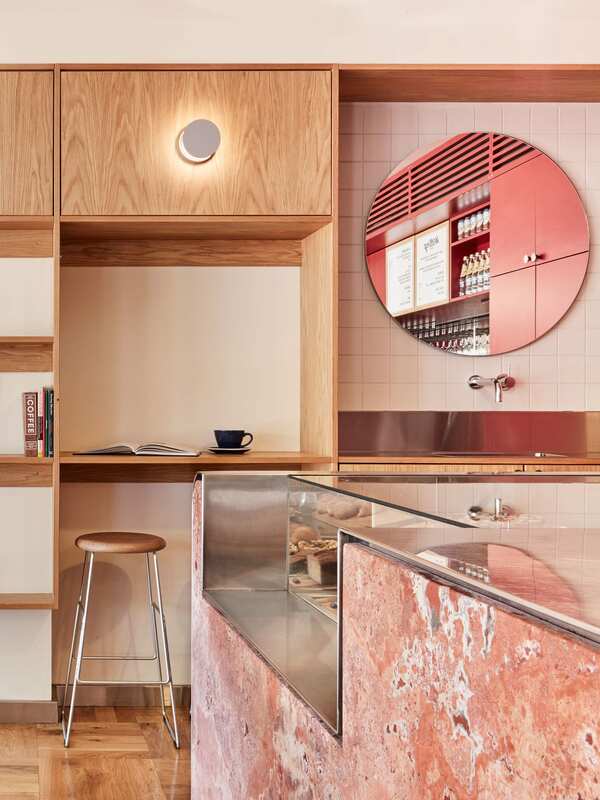 Ruby-coloured kitchen cabinets behind the counter assist in emanating rosy reflections throughout the café. 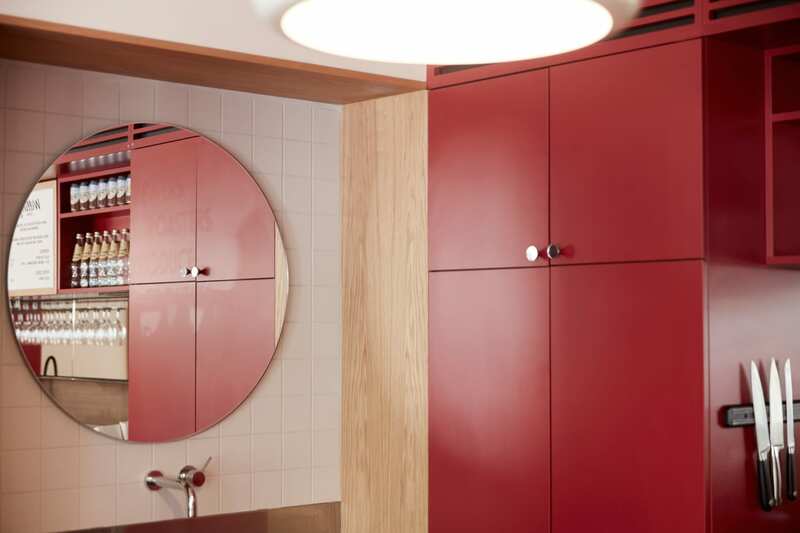 Consistent steel surfaces throughout ensure the small space does not look cluttered while retaining a functional appeal. 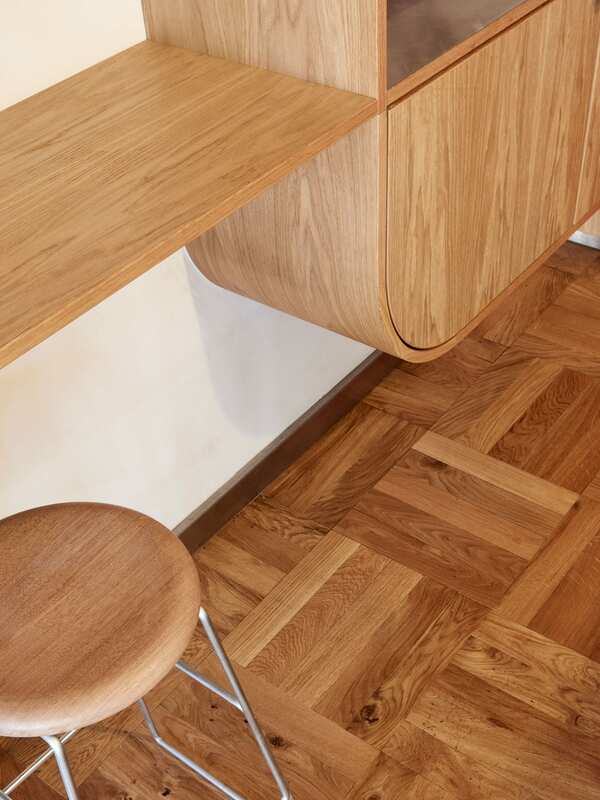 Besides stainless steel and travertine, European Oak is heavily featured, used for built-in seating, tables, and a curvaceous shelf. Tim and Veronique are passionate readers, so the shelf is stocked with a selection of up-to-date international papers and journals for patrons to peruse over an espresso. 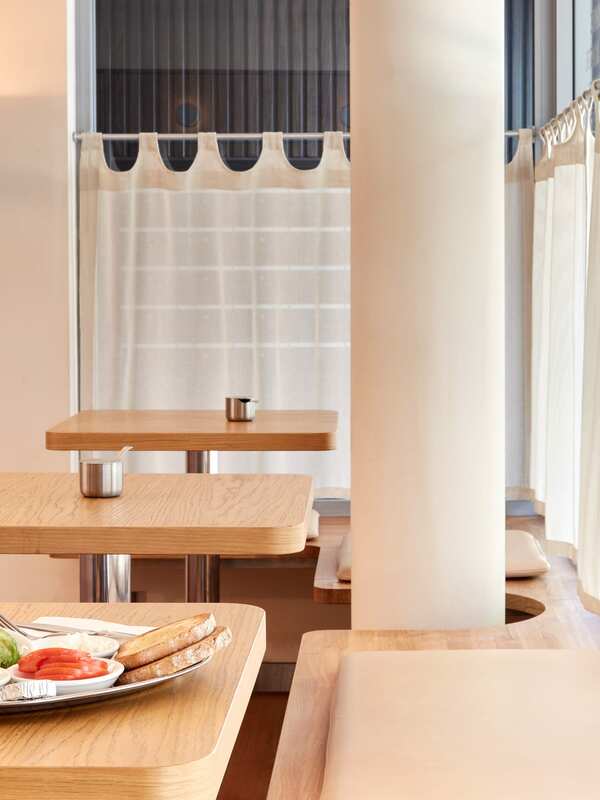 Willing Coffee has an intentionally small seating capacity, with the idea of fostering familiarity and encouraging customers to feel at home. 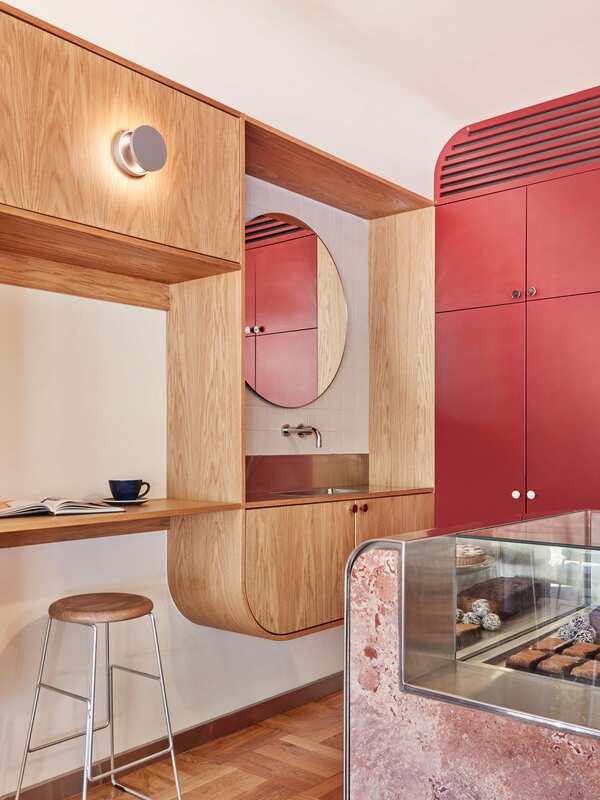 Related: Interview: Perth-Based Interior Architect Jen Lowe Of Ohlo Studio.